As a writer with a chocolate habit, I’ve got a few thoughts on chocolate. 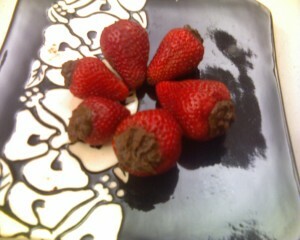 Another way to add health to chocolate: dark chocolate mousse stuffed strawberries. I originally wrote this when I was focusing on chocolate direct sales. Yet, it really is a better example of why I’m better at Explanatory Writing. I am not, nor do I want to be, a health, fitness, or nutritional expert. However, I will read articles written by those types of experts. I am not talking about chocolate flavored diet shakes, “healthy chocolate,” or any of that. I am talking about sugar-laden, fat-infused, wonderfully-craved chocolate. Because of that, we must all remember that moderation is key. So how is chocolate a health food? Most folks know this, and the type of chocolate seems to have little to do with it. Chocolate releases serotonin, the chemical in your brain that makes you feel good. So, need a happy pill? Try chocolate. Some would argue that happy is not healthy. True, but part of good health is good mood. And, there is just not enough happy in the world these days. While world peace may not be in the cards, how much closer do you think we would get if everyone were just a little happier? But, I am getting off topic. “Antioxidant” is such a buzz word these days, but do any of us really know what one is or why it is good? I will cover the second point first. A free radical is an atom or molecule with at least one unpaired electron, making it especially reactive to other atoms or groups of atoms. If free radicals react with certain chemicals in the body, they may interfere with the ability of cells to function normally. Lorrie’s Translation: free radicals are really active atoms/molecules that like to play havoc with cell function. Since the body is nothing but a collection of cells, it is in our best interest to combat things that interfere with that collection. Studies link the damage caused by free radicals to heart disease, cancer, Alzheimer’s, and several age-related conditions. So, antioxidants are good for you because they help protect your cells from things that would cause them harm. This is a good question because the answer is not simple. The word itself roughly means “anything that prevents oxidation,” but that definition is about as useful as a wood mirror. Flavonoids are available in colorful fruits, red wine, teas, and, my personal favorite, CHOCOLATE. Actually, cocoa contains flavonoids. When you start to add milk, sugar, oils, preservatives, and such to turn cocoa into chocolate, the flavonoid content goes down. This is why the experts recommend dark chocolate – the higher the cocoa percentage, the higher the flavonoid concentration. The problem with high cocoa percentages is that they lead to bitterness. While I tend to lean towards darker chocolates, 70% cocoa is about as much as I can handle, and only in small doses. So, what is a body to do? Eat good chocolate. Quality chocolate tends to have fewer artificial and other harmful ingredients. Cheap chocolate is going to be much higher in saturated fats, fillers, preservatives, and ingredients that you cannot pronounce. If you cannot pronounce it, do you really want to eat it? Another benefit of good chocolate is that it will do a better job satisfying that chocolate craving with less. You can get that happy feeling with fewer: calories, grams of fat, and gross ingredients. OK, so the point is this: chocolate is good; quality chocolate is better; quality dark chocolate is best. Explanatory Writing, Is Your Message Clear? What Makes a Good Blog Topic? Why Beat About the Bush? Everyone Just gets Lost. Fix it Yourself, Hire a Pro, Start from Scratch? Are You an Introvert Forced to Network? Become the Help.